Last week was eventful in the usual ways. Trying to catch up on work and teaching after being away. I did manage to finish my huge sculpture called "The Penguin Inside". This is a crappy photo of it on my desk. I don't have the space or lighting in our apartment to get a good shot of it. Anyway it's chalk festival time again and early Saturday morning I rolled out of bed and dragged Naomi out to the car. We were off to Tucson to create another chalk mural for their big 2 day festival. This was not a picture I'd ever physically drawn (usually I work it out on paper or recreate a painting that I've done), so I was a bit nervous. Anyway after an hour or two we were going strong. Without thinking about it too much I put 4 whiskers on the left and three on the right. I hadn't noticed or cared at this point but later on a woman kept coming by, just begging me to fix it. She obviously had OCD or something... It was driving her nuts. She was so adamant, but because I would have had to crawl across the drawing, I never did. Me, busy shading his shoulder. Around this point in the drawing a tiny, little boy came up behind me and said "IT'S A SQUIRREL!". So I said "You're right!!" and his mother looked at me and said "Really?" Anyway, this is where we were when we stopped for lunch. Naomi loved Marisa Salazar's owl drawing. This is my friend Matt Cotton starting his Grizzly bear mural. A nice little drawing in the kid's zone. Another one by spectators in the kid's zone. From there we headed to the food court where the pizza place served her most of the pie when she asked for a slice. On our way back to our site I snapped this photo of Wesley Fawcett Creigh's mural. About 2 hours later we decided to stop for the day. Before we left for the hotel, we took another walk around. This is Matt making more progress on his bear. Gina Ribaudo's Day of The Dead mural looked fantastic out in the courtyard. Back at the hotel we had an incredible view of Tucson from the 8th floor. From here you can see the hot tub that we headed straight to. I was pretty sore after drawing on the pavement all day. The next morning we were back at it. Here's Naomi finishing her work on the background. A lot of the kids at the festival were impressed with Naomi's skills and amazed she was only in 5th grade. We finally finished around 12:30pm on Sunday! I let Naomi do the final step of removing the tape -she was just itching to do it. 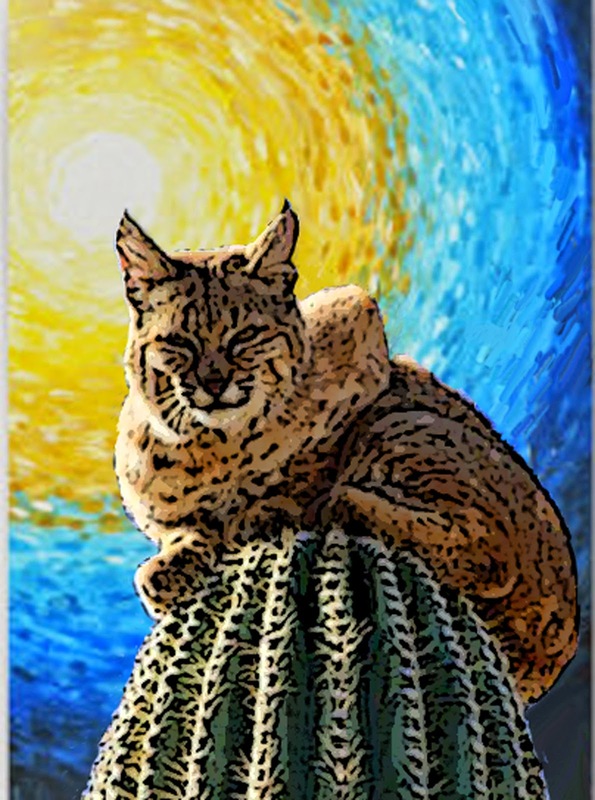 And here it is... "The Desert Cat"!! Linda Harrison Parsons was still busy with her mural. Jose Ignacio Garcia had finished his 3D scorpion and it looked amazing! Reuben Moreno's image was coming along. Martin Quinatanilla was nearly done as well. Anyway it was a great event and I'm really looking forward to seeing everyone again for the Phoenix Chalk festival on April 18th. I was just notified that I'll be at the Tempe Marketplace this time!